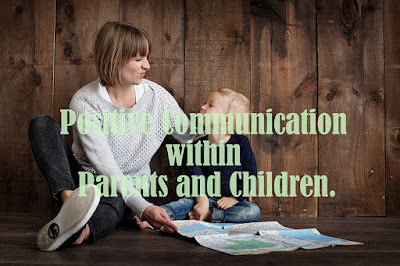 Home / Family / How To Establish Positive Communication within Parents and Children. Good communication is particularly valuable in the relationship between parents and children. Through good communication, parents can be engaging in positive relationships with their children. Recent research also states that children who grow up with positive communication with parents tend to have personality, resistance to stress and better self-esteem compared to children who have bad relationships and communication with parents. Communication skills are needed in parent and child relationships, starting from early to adulthood. Good communication is the key to a relationship of mutual respect and the creation of a healthy child and the creation of optimal growth and development. Give a positive response as a form of your interest or attention. The goal is for the child to realize that what he is saying is important to you. You can give verbal responses or you can also express non-verbal attention such as nodding your head or smiling. The attitude of the body can also reflect that you pay attention and are open to what the child is saying. Try to position the body in a condition leaning towards the child, not the other way around because it will reflect you are not interested, open arms position, avoid crossing your arms and support your chin because it can mean you are tired of listening to children. Verbal and non-verbal communication is equally important, parents often ignore non-verbal communication so that children can catch it as a negative signal such as rejection and disrespect. Be a parent as a reliable person. Offer help if the content of the conversation contains something that makes it difficult for the child, for the child to feel that we as parents want to be involved. You can also give advice if the child expresses his troubles in certain cases, given the limited problem-solving abilities of children. Parents also need to remember enough portions to help children so that children can still solve their own problems and their abilities continue to develop. Observe your child's feelings and accept them by saying their feelings. Sometimes children get caught up in the problems they face so they cannot communicate their feelings. By trying to understand them, children will feel that parents understand and accept their feelings. Focus on the child's conversation. Avoid other activities when the child is talking to the child, for example, while watching TV or picking up a telephone from someone else. If parents often do this, then over time the child will feel unappreciated and make them reluctant to convey their feelings to parents. If you are stuck in an urgent task situation, you should ask the child to wait, then give them particular time to tell stories than you are forced to do, such as "taking" work and listening, good communication will be difficult to form and allow other conflicts to arise. Always offer both times for more personal communication, unless there is indeed another party who needs to enter the conversation. But basically speaking together from heart to heart can build more effective communication. Eye contact is needed for good communication, one of which is to create mutual trust. Try to always have parents at one level when talking to children. The position of the head is parallel or one level also shows the child that communication is two-way and both have interests so that the child will feel more valued. Eye contact is needed for good communication, one of which is to create mutual trust. Try to always have parents at one level when talking to children. The position of the head parallel or one level also shows the child that communication is two-way and both have interests so that the child will feel more respect. Making a child shy in public is a Big No!! Don't embarrass children in certain situations. When children make mistakes, parents should wait to communicate their disappointment, giving a shame sentence in public is not a good way of communication. If you are angry about something in a child, then you should first reduce your anger, then communicate your disappointment. Talking when angry will eliminate the objectivity of the problem and not a good way of communication. In this case, humans are controlled by two things, namely emotions and logic, when angry, someone will get emotional and logic will drop. For that, avoid communication when angry because it will only contain emotions rather than logic. Also, read How To Build Closeness Between Father and Daughter?